Welcome the the Sneak Preview of the, Creator's Thombogo Sky Rider Industrial / Luxury Class Bike. This has been a long time project which he has been working on. During this long road, there has been some hurdles and mishaps along the way. This was the bike which had saved the life of the same person who is being interviewed as this interview is being read as of right now. 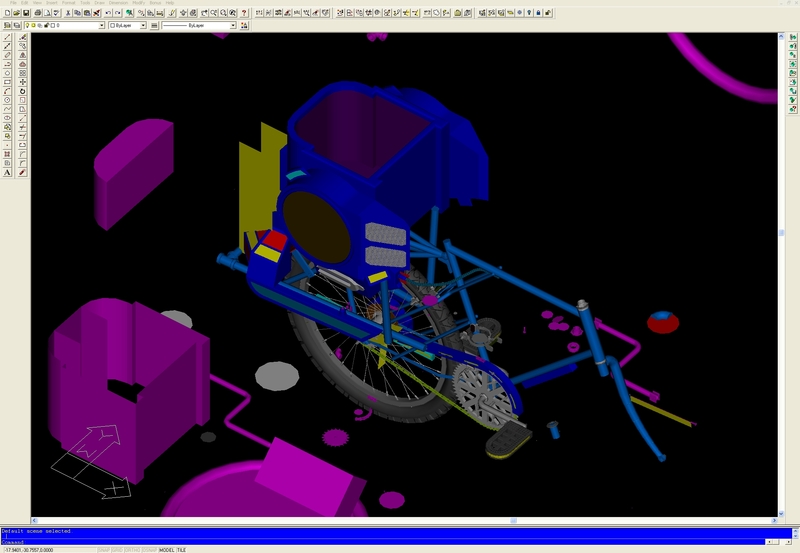 Down below are some pictures or drawings of the bike being drawn together in this popular C.A.D. 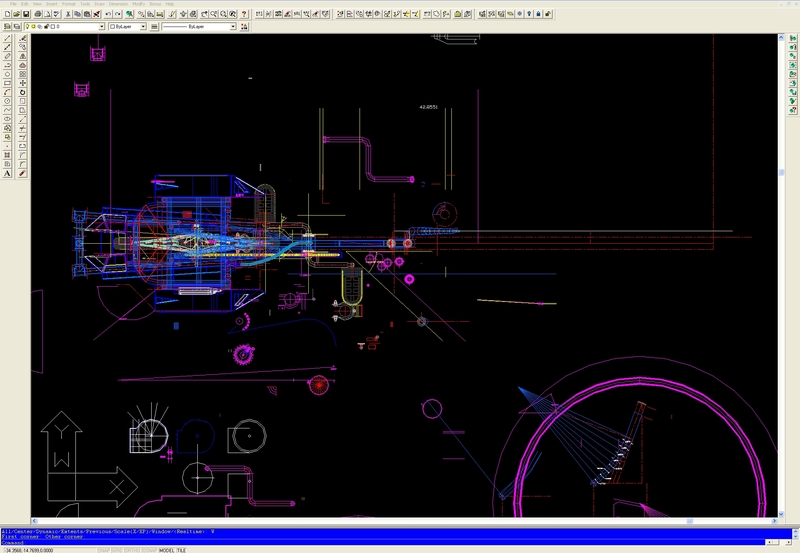 3D solid modeling software by, Thombogo. Even the creator of Thombogo would strongly require using this program for forming such sophisticated designs like the, Thombogo Sky Rider Bike. That picture above represents as if you were looking at the bike at a down angle at its left-side front section. 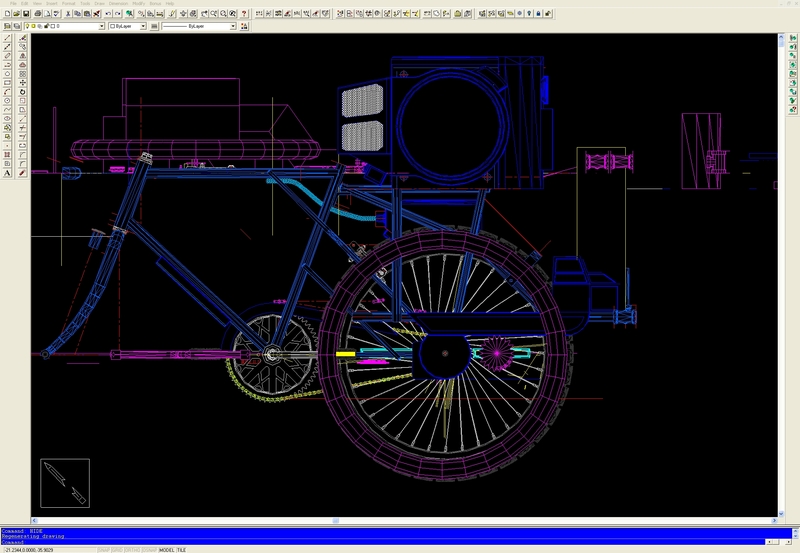 Supposedly, the creator had begin drawing the wheels, then gone to drawing the frame work and so on... Different colors or lines would display the deferent characteristics of the bike. Now, to view the next drawing. Here, the left, rear-side of the, Sky Rider can be seen. 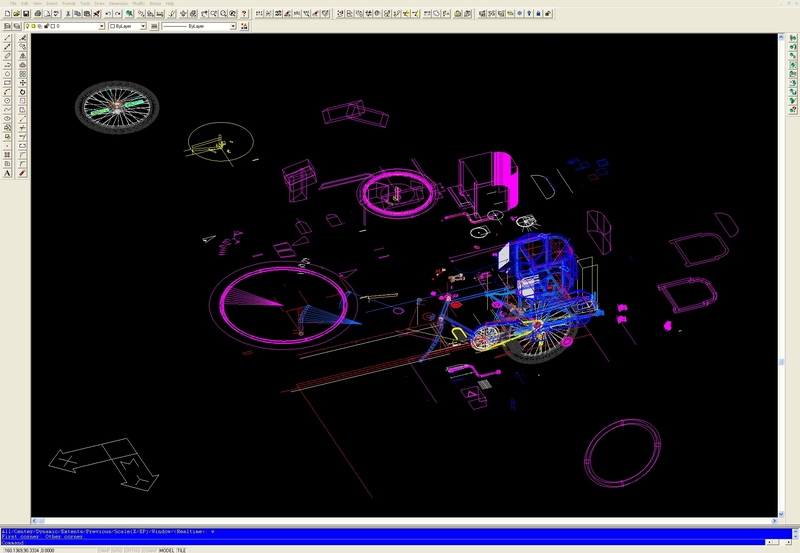 Have know idea of what extra 3D objects are in the picture. This appears that, the, "Hide" function used to make the lines in a more step by step detail. It would be like bringing out the objects to the closest and then having the farther object appear behind the closest objects. The next drawing is going to more detail than the last three pictures. The creator did say however, that, there is a special process to make 3D drawings come to life as he would say. The next picture or drawing is down below. Wow, what a render as the creator would call it! A drawing coming to life. It's a little fuzzy but, there are some more detail to go with the drawing. Lets all go to the, creator's workshop and see what he has to say about the, Thombogo Sky Rider. Questions which would be commonly asked by people, the creator would try to answer them to best of his abilities. "Thank you, thank you. Hello everyone, I'm here today to explain to you as what I would know. I'm sure some of you who had lived on the south-west side of the windy city or Chicago, IL had remembered me during the years of, 1996 through 1998 riding my NX model bike and the, Sky Rider bike around. It was a difficult time for my parents and for me back then. With the economy falling to the possible brink of extinction during that time, I needed to find a solution for survival. Allot of avenues witch I had tried had failed. So, I will try to answer questions you would have." Person #01: "Ya, does that bike have a engine on it? You know, what's with all metal on the bike, is that like a tank or something? It appears big. Creator: "Yo! The funny issue with that is, police officers all over city would sometimes stop me on the street and ask me that very same question and I would tell them no because I was simply, too pour at the time to be given or nailed to the cross with a moving violation ticket for having no, "L" or no motorcycle license. I had design a special gear ratio system from studying the specs on a sheet of papers which was sent to me by, Asian engineers who work at a popular bicycle company from over seas. I'm sure it is where their corporate office is at. But anyway, studying their gear ratio designs help me modify the gear crank case to make the, Sky Rider to go faster or at least up to 30 M.P.H. with out getting tired or fatigued regardless of its weight. At the time, I had no place of employment to save up for an, automobile to get around. In retrospect, how could I afford to pay for a traffic ticket. The metal is to protect any sensitive moving parts and electrical wiring under the metal body especially when riding the, Sky Rider around in the mid-western weather. Person #02: "Dude, that sounds cool, how heavy it that, Bike of yours?. Creator: "Between 150 to 160 pounds. Let me tell you, she's heavy. To ride that, you would precision balance as if you were pedaling a small motorcycle. With that gear modification, I had to find a way to make the, Sky Rider go faster than the, BMX bike. There were times that, I beat out some of my friends on their bikes however, like a cheetah, a cheetah can maintain up to 70 M.P.H. for up to a mile or so, then the cheetah would slow down. I tried going up at least 25 M.P.H. and was stable for a couple of minutes or so. The issue is, that my heart rate would beat up to 253 beats per minute and my head was starting to over heart up to 100.6 degrees F each time. Knowing that, the heart seems to be hottest area of the body, something about the circulatory system had to be medically calibrated to avoid a heart-attack but in theory, I believe with a third lung connected to the existing two lungs, more oxygen could be transferred to the main arteries to cool down the rest of the body like radiator fluid being distributed through the engine of vehicle. Person #03: "How far did you ever go that bike and did you ever carry or transport stuff on the bike? Creator: "Yes, the farthest I ever gone on that bike was from my house to somewhere at 22nd S. Cicero at a Omni food store sometime going back in the summer year of 1997. There was this radio station called "B96.3". I used to follow their radio van around to their group events if, I could gone that far without getting tired of course. I liked the music they had played on the radio at that time. I liked the D.J. 's and their music. Ah, those where the good old days. With the speakers on my bike, the tunes sounded cool. Did I transport stuff? Yes I did. I used carry 50 pound dog food bags or a 55 to 60 pound of a 5 gallon drum of pool chlorine each time. I was able to place two average sized grocery bags in the trunk including other stuff which I would need to bring home each time. The trunk is that box located between the two rear speakers. Now, when I realized that I was going to have allot of stuff like groceries or more barrels of pool chlorine to bring home, there would be this wooden box cart which I would used to transport the stuff items to my home. Person #04: "A cart, you used a cart on your bike?" Creator: "Well, again, I didn't have a car at the time to get around to get stuff for my parents. Because of the economy falling at time, my father was unable to save up any reasonable money to buy me a car for my 1995 high school graduation as he had promised. Why? He lost his job due to the falling economy two years previous before my graduation. There was nothing logically or/and feasible my both parents save up in the bank accept for food and bills of course. I didn't come from family with money or born with a silver spoon. My father was a labor who worked at a can factory, he's wasn't a doctor, or lawyer, or Indian chief, or dentist, politician or any of those other high-class paying job positions. For my three siblings, the was a large ten year age gap between me and them. I'm the youngest. The economy ten years prior for them wasn't as difficult and challenging for them to go on with their lives as it was for me. For that wooden cart, yes, that pull cart could hold up to 200 pounds of weight. That special gear ratio system was able distribute more power from my legs to the rear wheel to pull the 200 pound cart while pedaling. Person #05: "Wait, why didn't you use your folk's car to get around instead of your bike?" Creator: "You see, again, my father lost his job couple years previous before my high school graduation and he had no means to save money for a new vehicle to replace one of their two broken down autos. My mom had her car and my father had his truck. Both of their vehicles where falling apart with one vehicle inoperable to drive due to bad carburetor problem along with starter motor problems and other natural mishaps to go with those auto issue too. If their both vehicles were up and running, how could I drive them without having any auto insurance to drive them with no employment at the time to pay my auto insurance? I was unable to count on my sister since she was too involved with her marriage and her children. Person #06: "Why didn't you go into in armed forces if there were no employment opportunities for your?" Creator: "Oh man, another bowl of rotten cherries. You see, both of brothers were in the service. My one brother was shipped to middle-east when the war began on day one. He was there for about a year or more with-in serving his four years in the U.S.M.C. He came out and he's generally suffering from war memories like the other vets who served in the wars too. My oldest brother was in the service too. Served 20 years, he was in the war about ten years later after one brother was in the middle-east and something happen to him also after he had arrived in the United States. I really can not disclose the issue unless if I was given their permission to do so. Not all, but most of us had gone through some type of war here or there. All I can say is this, my both parents didn't want me to go into the armed service unlike my both older brothers who gone in at their own will and got out. My parents feel this time, if I would had gone in, I would been transported home six months later in a body bag from the war. Listen everyone, I need to complete the rest of my Sky Rider project - Thank you all for being here tonight, thank you and have good night. I'll let you all know about any other updates regarding the, Thombogo Sky Rider Bike. Thanks again.